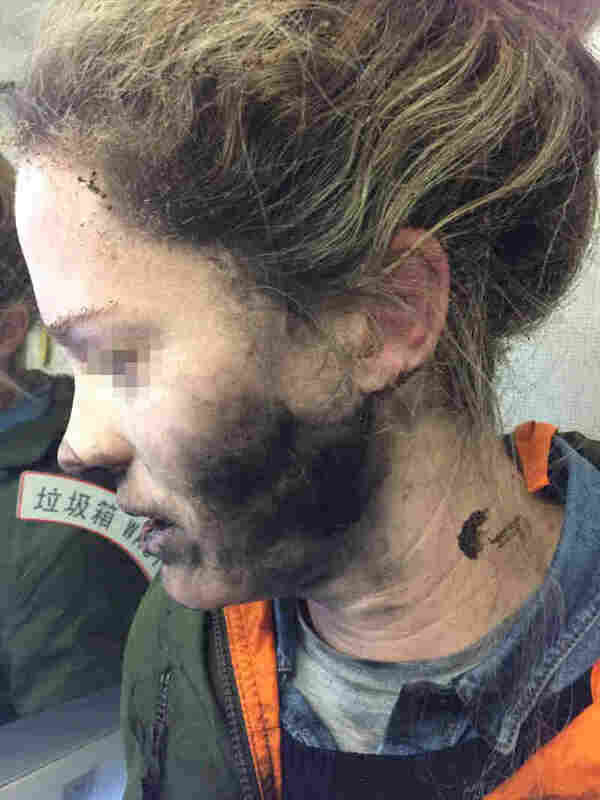 Woman's Headphones Caught Fire Midflight, Australian Authorities Say : The Two-Way On a flight from Beijing to Melbourne, a passenger's personal headphones caught fire while she was sleeping, the Australian Transport Safety Bureau says. A photo provided by the Australian Safety Transport Bureau shows an airplane passenger whose headphones caught on fire midflight. A passenger on a flight from Beijing to Melbourne, Australia, was listening to music on her own personal headphones when the headphones suddenly caught fire, the Australian Transport Safety Bureau says. The ATSB assessed that the batteries within the headphones were probably the cause of the fire. "As I went to turn around I felt burning on my face. ... I just grabbed my face which caused the headphones to go around my neck. "I continued to feel burning so I grabbed them off and threw them on the floor. They were sparking and had small amounts of fire. "As I went to stamp my foot on them the flight attendants were already there with a bucket of water to pour on them. They put them into the bucket at the rear of the plane." The ATSB says the battery and cover of the headphones melted to the floor of the aircraft, and the smell of melted plastic and burnt hair filled the aircraft. The press release doesn't identify the type of battery. But lithium-ion batteries, the kind widely used in rechargeable small electronics, have caused issues on planes before. Between March 1991 and December 2016, the Federal Aviation Administration documented 138 incidents at airports and in airplanes of devices smoking and catching on fire. The tally "should not be considered as a complete listing," the agency says. Culprits included e-cigarette devices, laptops, loose batteries and small devices crushed in seat-adjusting mechanisms. And the Galaxy Note 7, a Samsung smartphone whose lithium-ion batteries infamously caused explosions and fires, were banned on all U.S. flights months ago.